Michiana's best supplier of archery equipment and supplies since 1972. We sell Olympic recurve bows, compound target bows, hunting bows, cross-bows, traditional longbows, bow fishing equipment and beginner bows. We have a 20 yrd indoor range and offer archery lessons catering to all skill levels. Our repairs/technical services shop is full service. We offer equipment rental for use in our range. Scout troops and groups are welcome. Michiana Archery is the home of the Notre Dame Archery Club and the IUSB Archery Club. We sell many major brand bows/accessories and have many in stock. We sell sights, scopes, custom strings, limbs, quivers, peep sights, and all the other gear you'll need. If you do not see what you are looking for in our shop, we can order it for you. Our experienced staff will help you choose the bow and accessories that are your perfect fit. We are an authorized dealer for Hoyt, Matthews, Prime, PSE, Ravin, Genesis, Oneida, Bob Lee, and Win & Win. Michiana Archery is proud to be one of only five authorized US dealers for Win & Win Archery. You can order a Win&Win hunting or competition bow through our website, by phone, or by visiting our location. Browse our online Win&Win Store. Our USA Archery certified instructors provide both private and group lessons for beginner, intermediate and experienced archers. Buy a single beginner lesson and bring a friend free! All equipment will be supplied. Our recently remodeled 20 yard archery range is a great place to shoot alone or bring your group. We can accommodate Scouts, Pathfinders, American Heritage Girls, 4H, school programs, or you and your family/friends. We have USA Archery Adult and Junior Olympic Development Programs for people ready take the next step. We offer monthly and yearly range memberships. 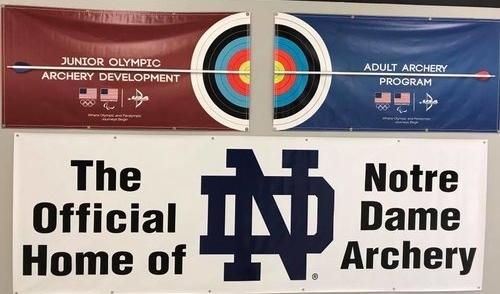 Michiana Archery is the home of the Notre Dame University Archery Club (including St. Mary’s College, and Holy Cross College) and the new Indiana University at South Bend Archery Club. Archery is a very relaxing sport, and all students can benefit from relaxation! Most students are new to the sport, so the clubs are very casual. If you are interested in creating an archery club for your school, contact us to sort out the details. Competitive Archery is welcome at our facility. We had great success with our own Thursday Night Winter League, and enjoyed having the traveling Michiana Field Archery League here for the past two years. We are also a sponsor of the Holiday Tournament, held annually at the Izaak Walton League of South Bend. Some of the area's top archers compete in these leagues and tournaments, but they are very welcoming to those just getting started in the competitive side of the sport. In warm months, the archers shoot Outdoor Field at Izaak Walton. The outdoor league starts May 22nd, and indoor leagues start in December. Contact us for info.